The Global Flight Systems prototype of a solar-powered drone has a 15-foot wingspan, but the final drone will be bigger. The model airplane hanging from the ceiling of Chris Bailey’s industrial-size garage in Waltham seems almost too fragile to fly, much less enter a race in which the grand prize is worth billions of dollars. But the race is on, and Bailey is sure he can win. 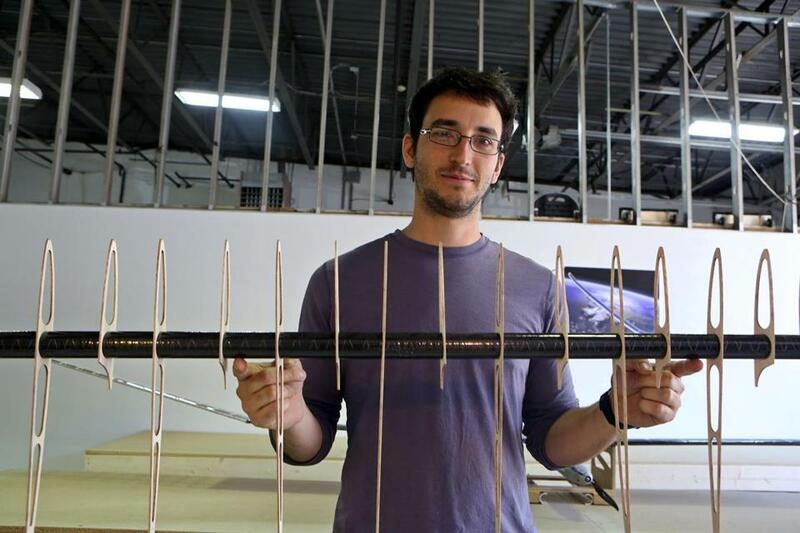 A mechanical engineer, Bailey cofounded a startup that is trying to build an unmanned solar-powered drone that could remain aloft for extended periods, serving as an airborne Internet or communications station, for example, or as a surveillance or surveying vehicle. The drones will have solar cells arranged along the upper surfaces of the wings that will continuously recharge the electric motors so the drones can fly nonstop for as long as two years. The model built by his company, Global Flight Systems, weighs just 5 pounds stripped down and has a wingspan of 15 feet, but in July it completed a test flight that lasted 27 hours. Bailey hopes to launch a larger prototype, with a 44-foot wingspan, this fall and have it loiter at 60,000 feet. The ultimate goal is a full-size drone, the Eos 150, with a 150-foot wingspan to generate enough lift to carry equipment like radios and cameras of up to 100 pounds. The technical challenges are prodigious. The ideal altitude for such drones is about 60,000 feet, where there is plenty of sunlight and the airspace is well above storm systems that could disrupt flight. The winds at that altitude average just 15 miles per hour. 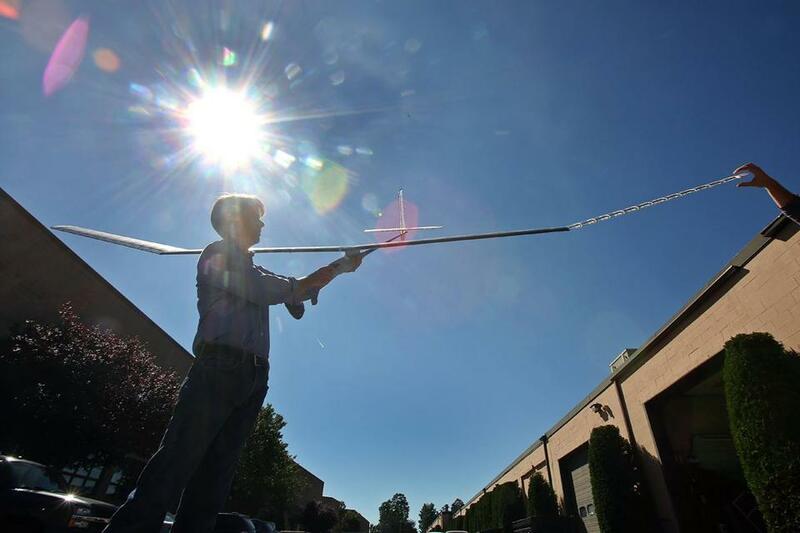 Global Flight Systems is building solar-powered drones. But it’s pretty cold up there — 70 degrees below zero or more — and that’s brutal on batteries. So the power pack must be carefully insulated and warmed with waste heat from the electric motors. It also has to pack enough power to work at night and run whatever equipment is on board. The business possibilities are huge. Designed to fly at about 55 miles an hour, Bailey’s drones could orbit over a fixed point on the earth — delivering wireless voice and data services to underserved areas of Asia, Africa, and Latin America, or shooting ultrahigh-resolution aerial images for military and intelligence agencies, farmers, and real estate developers. Bailey figures that aerial imaging alone could generate $1.7 billion a year for his company by 2021, by stealing business from traditional satellite providers. Imaging satellites cost half a billion or more, not counting the cost of boosting them into space. Bailey plans to charge $1.2 million for an Eos 150, no rocket required. And when the onboard electronics become obsolete, just order the drone to land and install an upgrade. Solar-powered planes are getting a lot of attention worldwide. A consortium of about 80 European companies has built Solar Impulse, a manned aircraft that will attempt a round-the-world solar-powered flight next year. But it won’t be a nonstop trip. The unmanned portion of this nascent industry, however, is intensely competitive, with three of the world’s mightiest corporations — Google, Facebook, and Airbus — deep in the development of high-altitude, solar-powered drones. In August, Airbus said its Zephyr long-range drone project conducted an 11-day non-stop flight. In March, Facebook acquired the British drone startup Ascenta. Google recently bought Titan Aerospace, and in September petitioned the Federal Communications Commission for permission to test the delivery of Internet service via its drones in the airspace above New Mexico. Bailey, his vice president of engineering, Nicholas Tucker, and composite technician Jerry DeChristoforo don’t mind a challenge. They came over from Terrafugia, a Woburn company that has spent the past eight years developing the Transition, an airplane that can turn into an automobile. Global could launch the first full-size Eos as early as May, if the company can raise about $1.8 million in financing. Michael Blades, who tracks the drone industry for the research firm Frost & Sullivan, said there’s a good chance Google will acquire Bailey’s business. But if Google doesn’t bite, Blades said, Bailey’s company has as good a chance as the others to be the first to produce a practical long-flying drone. Nicholas Tucker, vice president of engineering, held a partially built wing for the next larger prototype. The final model would remain aloft for extended periods.